Foundation reinforcement by micropiling applied by Sycons Kft. 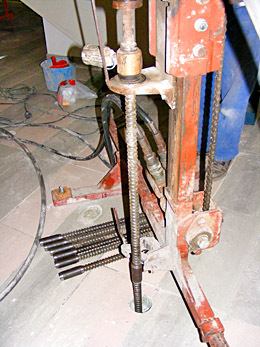 can be executed using drilled-injected soil anchors with rigid cores, installed vertically or nearly vertically (e.g. ISCHEBECK, GSI, DSI soil anchor systems), or pre-bored and posteriorly injected micropiles with steel cores. When drilled-injected soil anchors are used as micropiles, boring and pre-injection are performed simultaneously. In these systems, we use non-retrievable drilling heads appropriate to the given soil type, and threaded steel rebar cores as non-retrievable drill bits with a longitudinal internal borehole (which can be joined by threaded connections), and, during boring, we use cement slurry with a relatively high water/cement ratio to support the borehole walls and to evacuate the material excavated by the drilling head. This thin rinsing cement slurry penetrates into the soil gaps, cementing the whole periphery of the borehole. In order to create the load-transferring anti-corrosive cement surface of the micropile, we use a very thick cement slurry (with low water/cement ratio) to perform the “closing injection” using high injection pressure. When drilled-injected soil anchors are used as micropiles, the micropiles can also be executed in one phase, by drilling through the RC slab using a special drilling head. 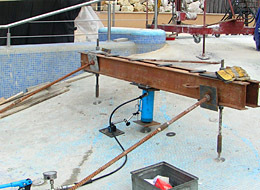 In this way, load transfer between the micropile and the concrete slab will be easy to establish and free of corrosion. When constructing injected micropiles with steel tube core, firstly the borehole is executed, the diameter of which is defined in function of the planned external diameter of the pile. The borehole walls are supported using thin cement slurry. Secondly, the perforated steel pipe (core pipe) used as core bar of the pile is installed in this borehole. When the cemented borehole body around the core bar starts to set, the final injection of the micropile periphery is also started injecting thick cement slurry at high pressure. We use a special hydraulic load testing equipment to check the effective load-bearing capacity of the constructed micropiles. Bonyhád, Roman Catholic church, Building subsidence stabilization and foundation reinforcement works by micropiling.